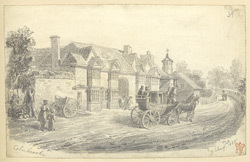 This lively pencil drawing depicts the village of Colnbrook near Windsor. Colnbrook is home to a number of inns, of which "The Ostrich" is reputed to be the third oldest in England. This particular inn has a gruesome past. During the 17th century it was run by the Jarmans, who built a trap door underneath one of the guestrooms. When wealthy clients slept in the room, the door would be released to send them to their deaths in a vat of boiling water. The Jarmans were later hung for robbery and murder. On a happier note, the village became the site where Richard Cox cultivated the famous "Orange Pippin" variety of apple.